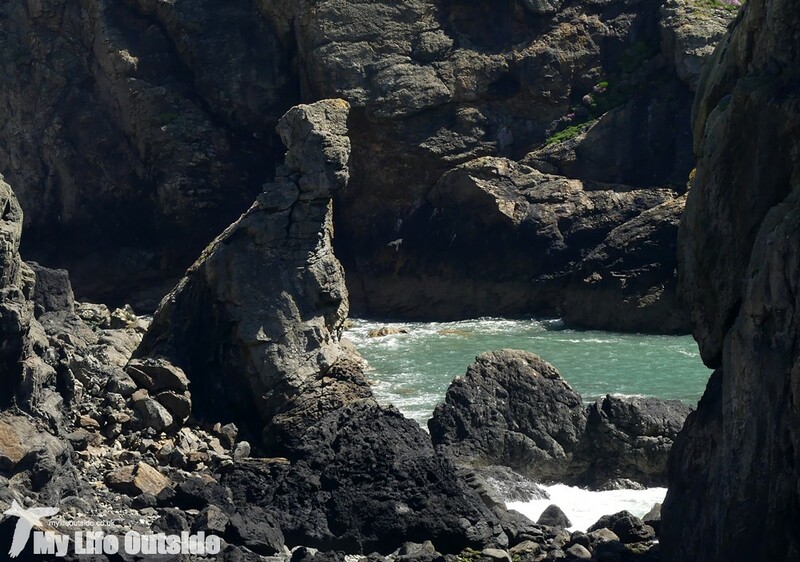 Fingers and toes were well and truly crossed as we drew back the curtains on our second and final day in Pembrokeshire. 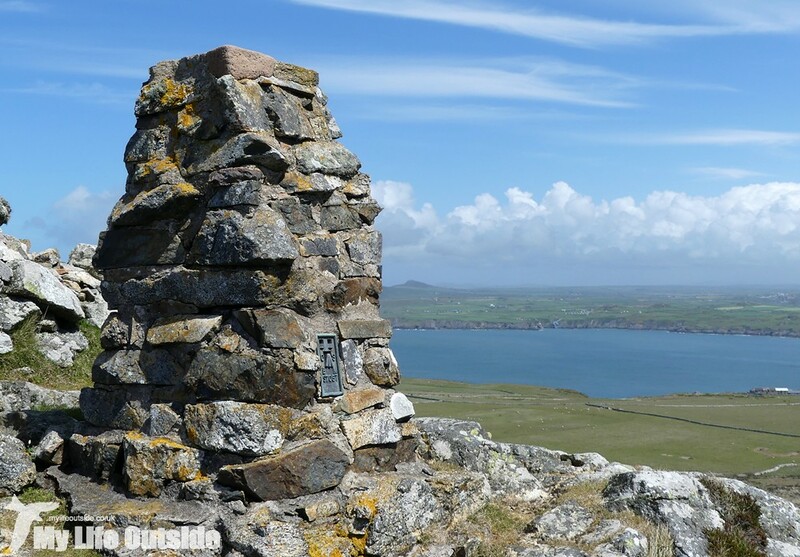 Would the wind have subsided enough to allow us to make the trip out to Ramsey Island? Initial impressions were promising with a light breeze rippling through nearby vegetation and more encouragingly a complete lack of white horses out at sea. Even so the precarious nature of landing points along this stretch of coastline means that local conditions can vary greatly so it was a huge relief to receive the phone call from our boat operators that the trip was indeed on. I’d like to report that what followed was a jump into action but let’s face it, this was Sunday and we’d been up late the previous night despairing at Europe’s musical tastes. Portugal, really Eurovision? That being said we still arrived in plenty of time at our departure point of St Justinian’s just down the road from St David’s. If we were in need of spiritual guidance then we’d clearly come to the right place. I however prefer to focus on more earthly matters, more specifically the three RNLI lifeboat stations that nestle into this picturesque cove. 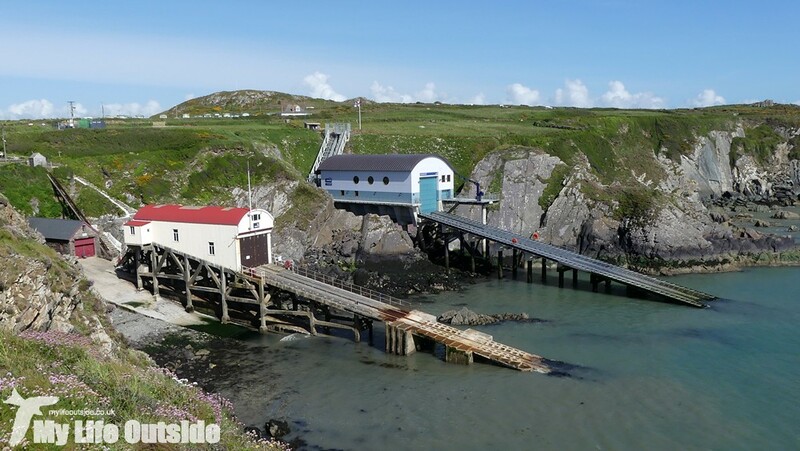 The first dates from 1869 and consisted of a boathouse and slipway in front of which the now iconic 1910 structure was built. Buildings like this have become synonymous with our coast but as the technology and size of modern day lifeboats has increased they have been increasingly found wanting. The introduction of the RNLI’s Tamar class finally forced a rethink and for several years now the RNLI has been undertaking a programme of modernisation. Recently it was the turn of St David’s and the result is a gleaming new structure right next door to the old one, ready to keep our seas safe for another hundred years. The photos above hopefully demonstrate how short the supply of natural harbours is around here but the old slipway provides an ideal point at which to board for the sailing over to Ramsey. 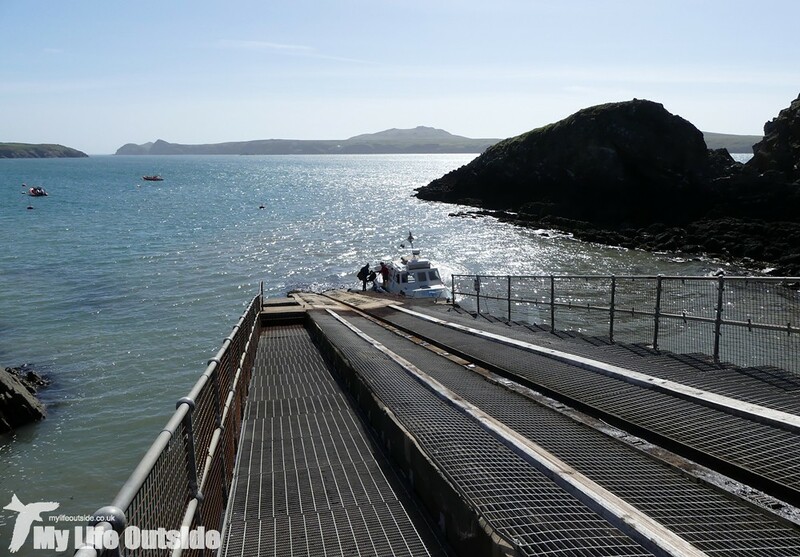 I may have been the only person present who found this almost the most exciting part of the day as when else do you get the opportunity to walk down an elevated lifeboat slipway? Never in my experience so consider this another bucket list item ticked off. 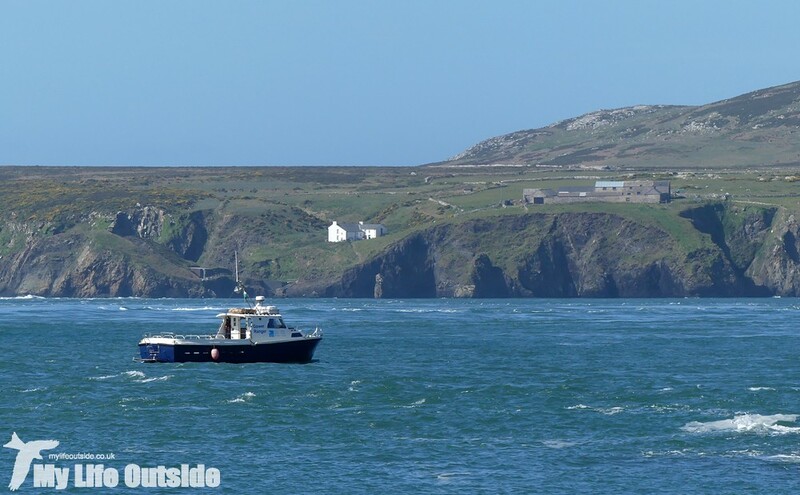 Once aboard and having avoided the ire of our captain who had to explain to a fellow passenger that standing with one foot on the boat and the other ashore was not the best of plans, we were off. Now anyone that has crossed to Skomer will know that the boat used there, though perfect for its job, is not what you’d class as especially powerful. Our Ramsey chariot looked similar and glancing across the raging waters of Ramsey Sound I did wander how this was going to pan out. Known for its turbulent waters and strong currents it’s not the kind of place you want to trifle with but I needn’t have worried. As soon as we were clear of the slipway our captain gunned the engines and we shot off, weaving our way through the hazards with an air of one who knows these waters like the back of their hands. Despite a large swell I only ended up with one mildly moist foot before we were docking on Ramsey mere moments later. During the brief crossing we’d enjoyed the sight of Kittiwakes and Gannets but were eager to see what the island proper had to offer. Having never visited before the ubiquitous introductory talk was particularly useful before we were let loose to explore for ourselves. Immediately I fell in love with Ramsey. With our boat carrying no more than twenty people we virtually had the place to ourselves and what lay before us was some of the best coastal scenery I have seen for some time. 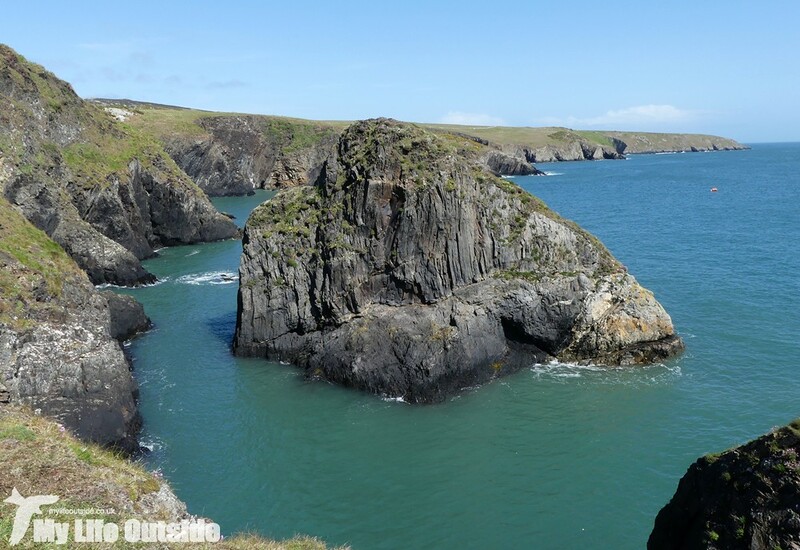 Wide expansive views across to mainland Pembrokeshire abounded whilst Ramsey itself was a mass of inlets, arches, stacks and cliffs in every imaginable combination. It truly was breathtakingly pretty with each curve of the path revealing a new vista. 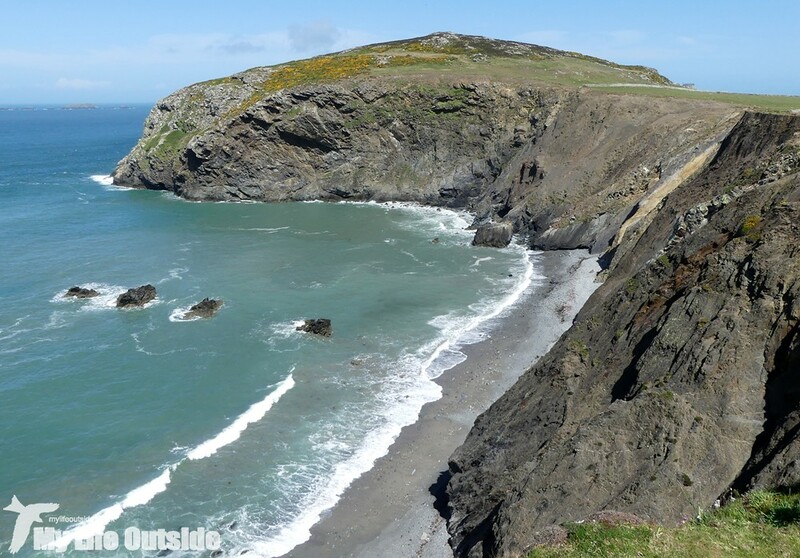 One minute we’d be enjoying Fulmars stacked high on the cliffs and another be marvelling at the sight of ten or more Grey Seals enjoying the sound of their voices as they reverberated around the sea cave into which they’d hauled out. Then of course there were the flowers. Now I’ll freely admit to not being much of a plant aficionado but that doesn’t prevent me from being able to enjoy and appreciate the swathes of colour which draped themselves over the more sheltered areas of the island. 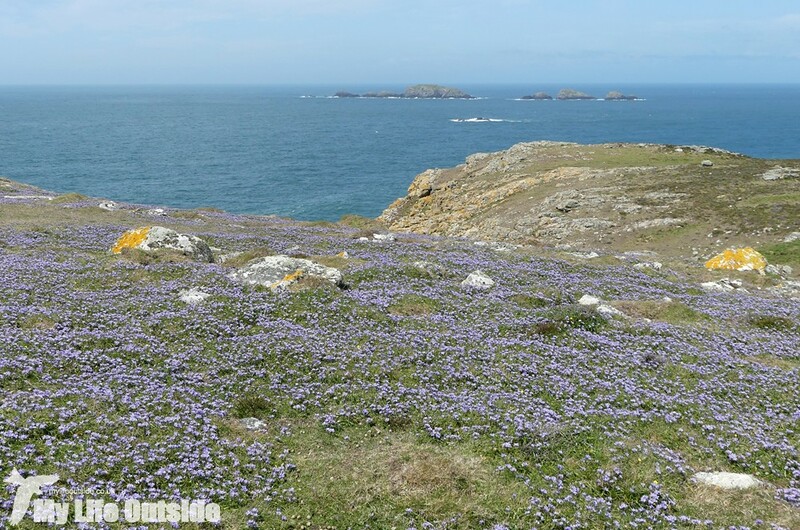 The most prominent species here are Bluebells and Sea Squill, both of which looked to be at the height of their powers. It’s at this point that the inevitable and unavoidable comparison with nearby neighbour Skomer must rear its head. 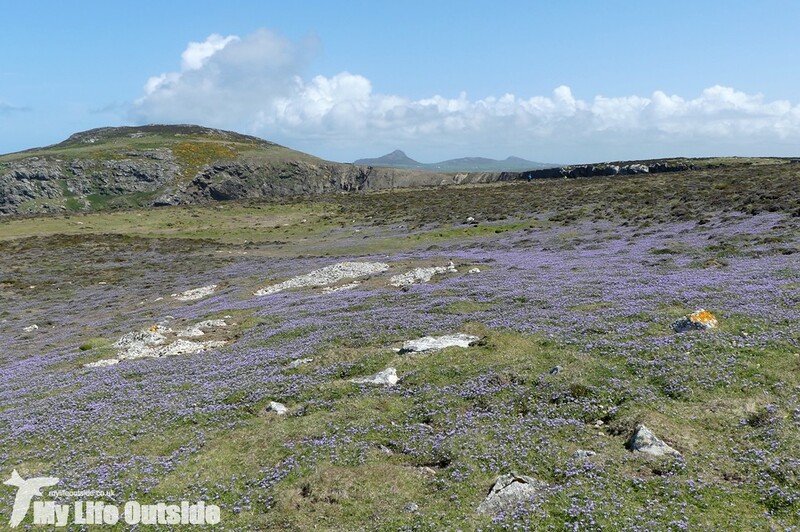 For many, and I count myself here as well, Skomer is the Welsh island to visit thanks in a major part to its Puffins. I challenge anyone not to fall in love with these colourful characters as they waddle between visitors and fly in with beaks stuffed full of Sand Eels. 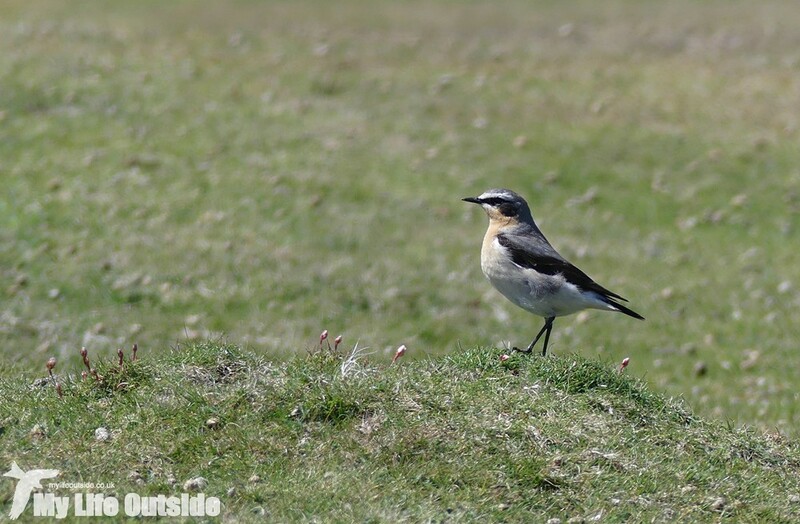 Add in almost guaranteed Chough, Short Eared Owl and a variety of other nesting species and it’s no wonder that the island has been getting busier and busier over the years. Ramsey in contrast has no Puffins (thanks mainly to its population of Rats which have only recently been cleared) and its cliff nesting birds are trickier to see which may be the reason I’d never considered a visit previously. If you find yourself nodding away at this point then stop and cast those preconceptions aside. For what Ramsey lacks in Puffins and accessible nesting birds it makes up for in spades with sheer character and atmosphere. You’ve already seen the views above but nothing can capture that essence which makes a place just feel right. I probably spent the entire day walking around with a massive smile plastered across my face and was in such a good mood that I finally succumbed to the RSPB pin badges which I’ve been admiring for so long. There’s another collection that I’m going to be driven to complete but at least the money ends up going to a good cause! Don’t get me wrong though there are birds a plenty. 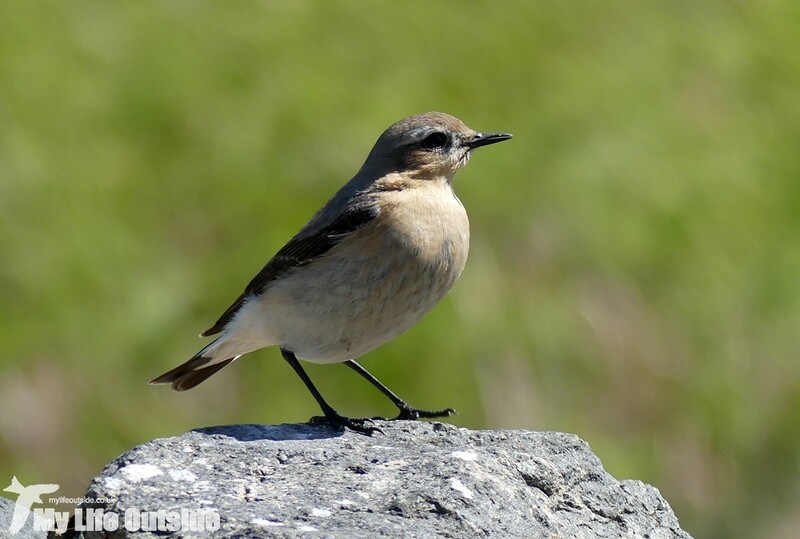 Choughs were an almost constant presence with our best sighting a flock of six and Wheatears were absolutely everywhere. Some were incredibly accommodating but I never did manage to capture my dream shot of one in amongst the Squill. Then of course there’s the Little Owls (which completely evaded us despite much searching) not to mention commoner species including Meadow Pipits, Linnets, Ravens and Peregrine Falcons. 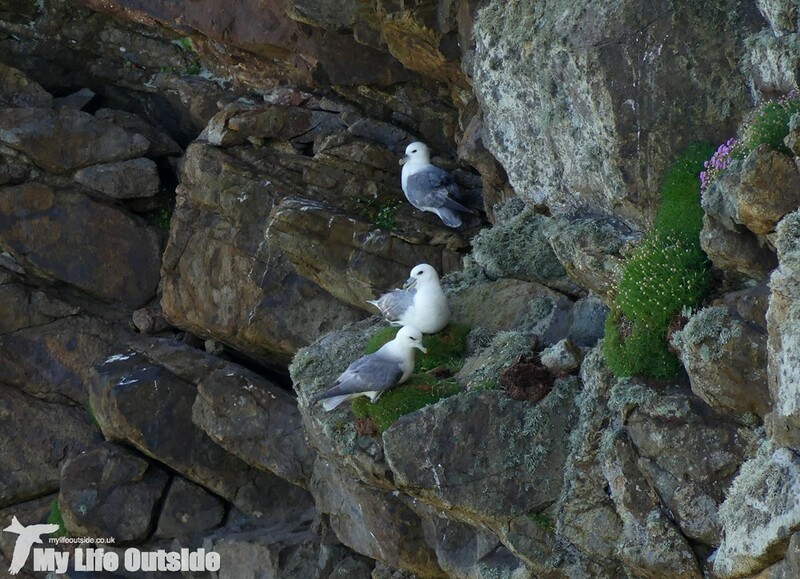 You can’t fail to spot Fulmars nesting on the cliffs either and Razorbills and Guillemots are a common sight rafting on the water and, with a little effort, also seen on the cliffs. 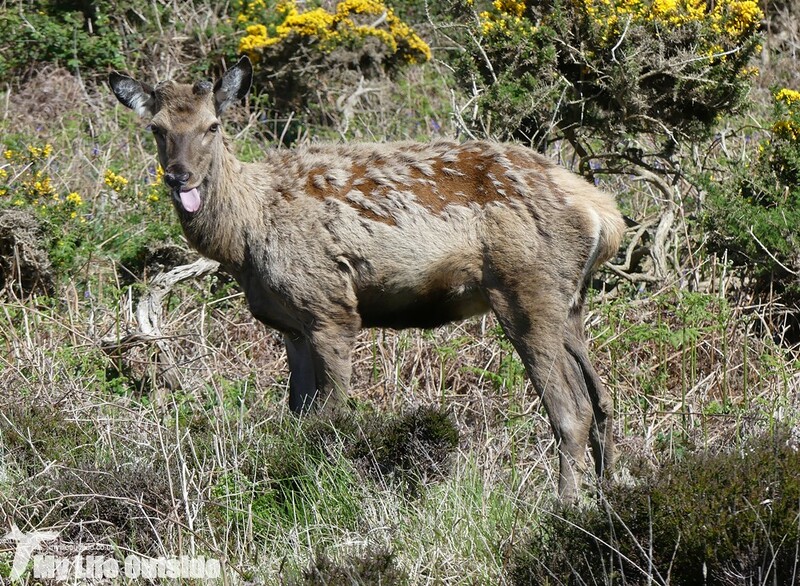 And let's not forget the completely unexpected in the shape of a small herd of Red Deer, remnants of a population which was farmed here until the 1970’s. On a small island sightings were almost guaranteed but I assumed they’d be distant. Turns out I was ever so slightly wrong on that score. The first three females we saw legged it but later in the afternoon we stumbled across a stag, his hind and one of last year’s juveniles. 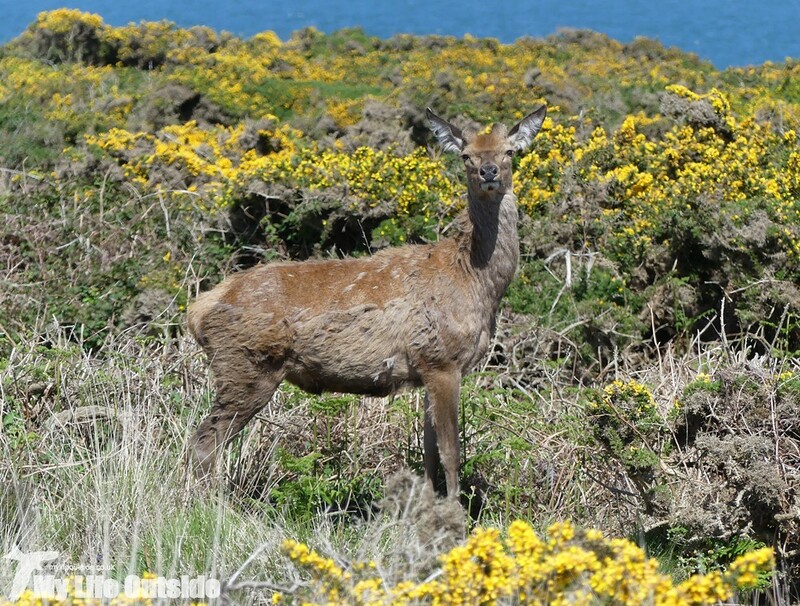 All three were contentedly munching away amongst the Gorse barely a couple of meters from the path. Were this Scotland you wouldn’t have gotten anywhere near but I guess the animals here are pretty well habituated and, apart from a touch of nervousness from the female, they paid us virtually no attention. When the time came to catch our return boat some six hours later we were cream crackered, but I wouldn’t have missed it for the world. 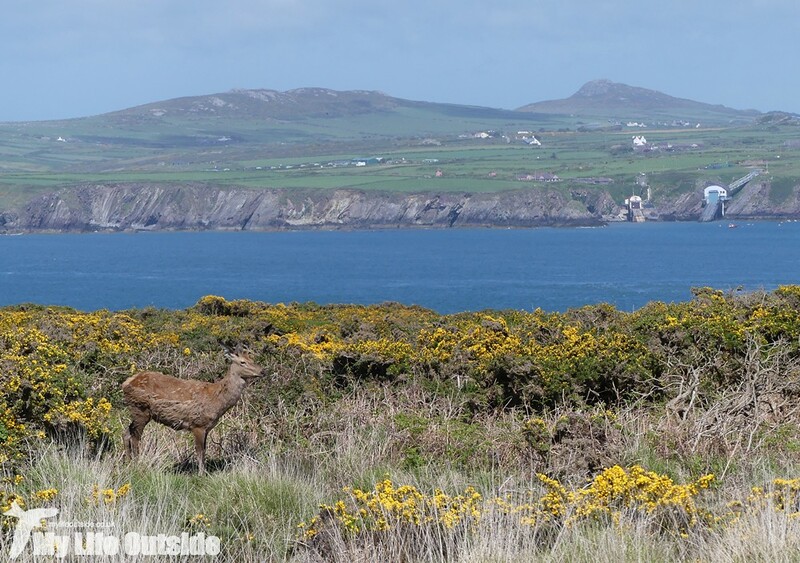 Having spent the last decade or so exclusively visiting Skomer, our discovery of Ramsey has been a real awakening. Yes I know it wasn’t exactly hiding, hell we’ve looked across to it many times before, but discounting Ramsey without much of a second thought has been a grave error of judgement. Still, better to finally find out what you’ve been missing than to never have found it at all. 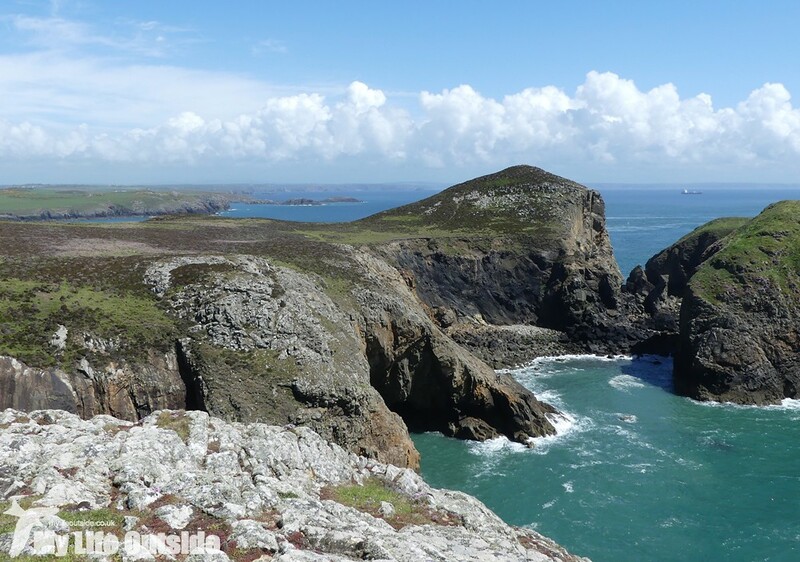 So is this the end for our relationship with Skomer? Definitely not. Despite their proximity and outwardly similar appearance, the two islands are very different in both character and habitat. Whilst Skomer probably wins on the bird front, mainly thanks to those Puffins, it can feel a little more controlled undoubtedly thanks to the larger number of visitors it receives. Ramsey on the other hand is an island of big scenery and wide open spaces, not to mention barely another soul in sight. Suffice to say both will be making it onto our annual list of places to visit and we may make another trip out to Ramsey before the year is done. After all, there’s still a lot more pin badges that I need to collect ………..